University of Maine at Presque Isle Associate Professor of Geology, Environment, and GIS Chunzeng Wang recently delivered a presentation on Maine geology at Guilin University of Technology, located in the city Guilin in Guangxi Province, China. 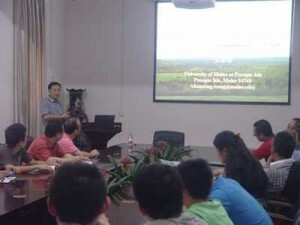 Dr. Wang gave a lecture entitled Deformation History and Rules Played by Orogen-Parallel Transcurrent Faults: Example of the Norumbega Fault System in the Northern Appalachians in Maine, USA, before a large gathering of faculty and students from Guilin University on June 21. Dr. Wang has conducted research on Maine’s Norumbega Fault System since the late 1990’s. The Norumbega Fault System is one of the largest and longest fault systems in the Northern Appalachian Mountains. At the meeting, Dr. Wang discussed the details of the faulting mechanisms and historic evolution of the fault system. Based on his research, the fault system played a critical role in the orogenic evolution of the Northern Appalachians, in particular in Maine’s geology as far back as 380 million years ago. Dr. Wang answered questions regarding fault features, study methods, as well as differences between Chinese and U.S. geological project conduction and management. Faculty and students at Guilin were pleased with Dr. Wang’s presentation and in particular his interaction with the student audience. In his presentation, Dr. Wang emphasized sound theoretical training needed in the field of geology as well as the importance of fieldwork. Dr. Wang’s visit to the University was part of his international collaborative research with faculty there. During his travel in China this summer, he also plans to visit the Chinese Geological Survey Research and Development Center’s Data Processing Center and attend a national project team meeting with his collaborators on another project in Beijing on July 5. In addition, he has been invited to give a presentation to officials of his home county government on local geological background and geological resources on July 3. To see Guilin University’s report on Dr. Wang’s visit, please visit http://departs.glut.edu.cn/zhx/new/laoy/Html/?905.html.